With my Divine chocolate stash for #NationalChocolateWeek, I couldn’t go without making something with at least one of the bars. An excuse, if any were needed, to indulge. We Should Cocoa is all about the USA this month so as Cornish autumn raspberries are still available and having a bar of Divine raspberry 70% dark chocolate to hand, it’s a no brainer – raspberry fudge brownies it is. Brownies are an American classic that I was first introduced to over twenty years ago by an American baking friend. I’d never heard of them before and was delighted by their sweet chocolatey fudginess. I’m not sure I’ve ever managed to make any quite as good as hers, but I never give up trying. They are my go to bake when I’m in a hurry. These are quick to make and slightly healthier than your average brownie as they’re made with wholemeal flour and less butter than most brownie recipes. It goes without saying, they’re also quite delicious, being both fudgy and fruity with bursts of caramelised white chocolate. The weekend starts here. Now where’s that clotted cream? 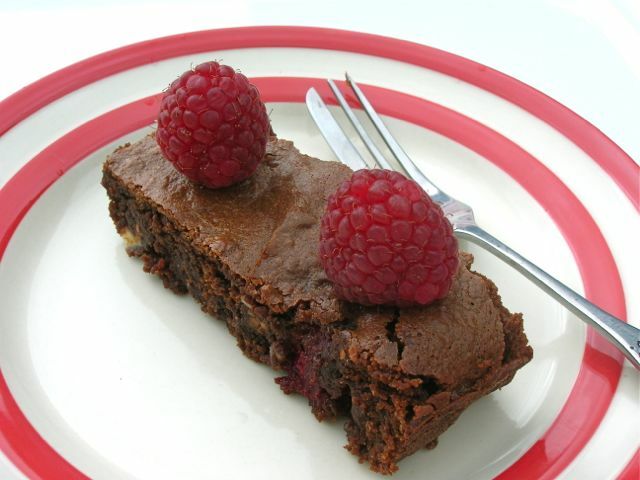 A rich fudgy and flavoursome brownie made with both raspberry chocolate and fresh raspberries. It also uses wholemeal flour, has some surprise white chocolate chips and is very quick to make. Melt the butter in a large pan over a gentle heat. Break up the chocolate, turn off the heat and add to the pan. Stir until melted and combined. Stir in the flour followed by the white chocolate. Fold in 80g of the raspberries as gently as possible so as not to break them up too much. Scrape the mixture into an 8" / 20cm sq silicone cake mould or lined tin. Bake at 180C for about 20 minutes when the top should be set, but the mixture still has a slight wobble. Leave to cool in the pan and then cut into 12 slices. Getting the texture of a brownie just right is not always easy. Leave it too long and it can become cakey rather than fudgy, but take it out too soon and you can end up with goo. If this happens, place it in the fridge for a few hours and it should firm up. In my experience, it's always better to undercook than overcook. 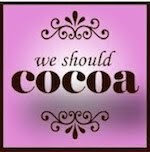 Tracy over at It’s Not Easy Being Greedy has chosen the theme, USA, for this month’s chocolate extravaganza, aka We Should Cocoa. Brownies are one of America’s best known bakes over here in the UK and I have done my fair share of spreading that brownie love. As the Cornish raspberries were bought at my local greengrocer’s, the properly free range duck eggs at our Friday Country Market and the flour from our local mill at Cotehele, I’m sending these raspberry fudge brownies off to Elizabeth’s Kitchen Diary for Shop Local. Brownies are just perfect when you’re In a Hurry, which is the theme for this month’s Love Cake with Ness at JibberJabberUK. Apart from sugar, eggs are pretty much the main ingredient in brownies, so these also go to Dashing Dom over at Belleau Kitchen for Simply Eggcellent. I’m cheekily sending these raspberry fudge brownies off to the ever forgiving pair at Alpha Bakes, Caroline Makes and The More Than Occasional Baker. The letter is W for the Wholemeal Flour which is an integral part of this brownie recipe. And lastly these brownies are winging their way to Bake of the Week with Helen at Casa Costello. I’m also sharing this with Charlotte’s Lively Kitchen and the #FoodYearLinkup for #NationalChocolateWeek. Thanks for visiting Tin and Thyme. If you make these raspberry fudge brownies, I’d love to hear about it in the comments below or via social media. Do share photos on your preferred social media site and use the hashtag #tinandthyme, so I can spot them. For more delicious and nutritious recipes, follow me on Twitter, Facebook, Instagram or Pinterest. Don’t forget to enter my Divine giveaway for a whopping 12 x 100g bars of chocolate. Raspberry Fudge Brownies. PIN IT. How absolutely Divine in all aspects! I must look out for the raspberry flavour of the chocolate. In my experience brownies don’t last long after they have been made! I love Divine chocolate, both for their ethos / business model and the chocolate itself. These brownies look lovely! Thanks Kavey, glad to hear you’re also a fan. Thanks Elizabeth. Now if only the chocolate and sugar had been local too! You might as well have an extra slice then, I suppose ? You are very lucky to be able to buy fresh, free range, local duck eggs ! As well as local raspberries at this time of year. I too love to add fruit in my brownies. These look heavenly, Choclette. Thanks Angie. Raspberries go particularly well with dark chocolate I find. What sort of fruit have you added? Dark chococlate and raspberries is the best combo. I lovr the texture of the brownie. These look absolutely beautiful and delicious!! 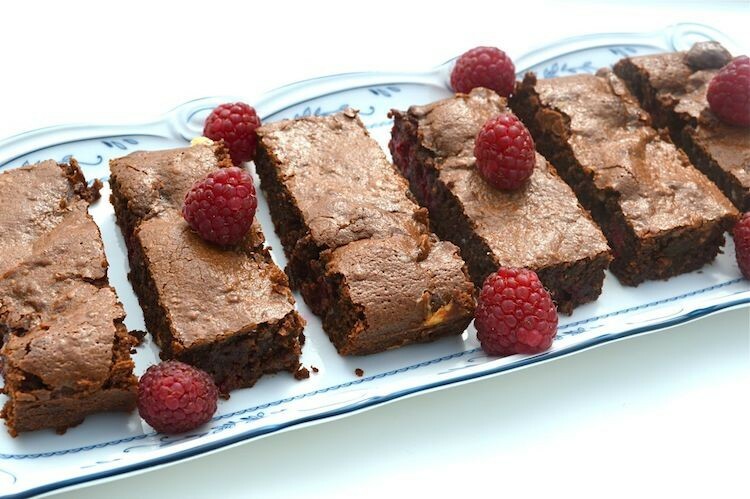 Brownies are my favorite dessert of all time, and your addition of the raspberries makes them extra special! Pinned! Raspberries are a wonderful fruit indeed Lyndsay. Hope you manage to find the chocolate. I love how easy this is, and that you have sneaked in some wholemeal flour. Now to find some white chocolate chips! Every brownie recipe I make I reckon is the best ever – I think I just like brownies! Love, love, love brownies – and intrigued by the wholemeal flour – makes them sound healthier! I always use Nigella’s recipe but I am very tempted to give your version a try. They certainly fit the USA brief for #WeShouldCocoa – thanks so much for sharing. By the way, there’s something rather lovely about an undercooked brownie – or is it just me?! No, no, it’s not just you Tracy, undercooked brownies are wonderful and SO much better than overcooked ones. I couldn’t stop giggling when I read this Henk and although I like the idea of National Whipped Cream Week, I think National Clotted Cream Week would be better. As for the chocolate diet, I think I’ve been on that all my life 😉 In all seriousness National Chocolate Week is about raising the awareness of real and artisan chocolate rather than most of the rubbish we eat here. These look great. I love baking with muscovado sugar and the addition of white chocolate chips and raspberries sound delicious. Thanks Amanda. Muscovado is the king of sugars and works particularly well in a brownie. These look so beautiful and I LOVE the use of wholemeal flour! Definitely one to try! Thank you Charlie 🙂 I always use wholemeal flour in brownies as you’re not looking for a nice rise, but want them dense and fudgy. It works really well. Wow Choclette! I could eat a whole batch of these….. I am a serious addict for raspberry and chocolate together….. A perfect use for that bar of raspberry chocolate (although I am not sure it would have made it any further than my mouth)! Strangely you are not the first person to say that Kate 😉 I’m not sure I’d have managed it either if I didn’t have such a bounty of chocolate at my disposal. Brownies. Love love brownies. Don’t mind a little raspberry either. These look fantastic!! I’m so glad you told me that you made these because I’m definitely bookmarking them and saving this recipe for later! 🙂 Thank you for sharing this recipe! These look simply DEVINE! Chocolate and raspberries are one of my all time favorite flavor combinations. Have you ever tried freezing your brownies? I actually cut my brownies in to bite size pieces, freeze them and eat them straight from the freezer. They don’t freeze solid. Instead the maintain their amazing Fudgy-ness and they become more chewy… But in a good chewy kind of way. And if I’m feeling really naughty, then I’ll mix those frozen brownie bites into a big bowl of ice cream topped with whipped cream and salted nuts. Ooh I love brownies, the gooey centre and slightly crunchy top and these look so delicious with the addition of white chocolate and raspberries. I’ve not tried making them with wholemeal flour before so I’ll have to give that a try. Thanks Charlotte. A good brownie, as you describe, is very hard to resist. These ticked all the boxes. I always make my brownies with wholemeal flour, it works really well. I’m going to find some rasberry chocolate and make these today. Yum! Oh I hope you managed to find some Ange. Let me know how you got on. Oh raspberry brownies!! Sounds amazing! I can have one piece for dessert tonight! Yum! 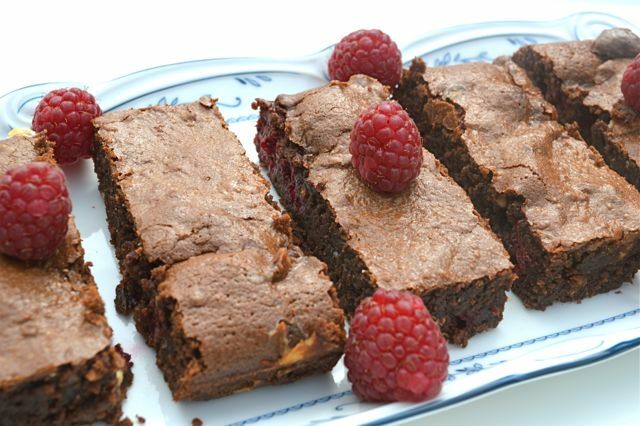 Chocolate and raspberries are a match made in heaven, very restrained sized slices there, so I take it they are very rich and yummy as brownies should be. For all the fancy cakes I make, I think chocolate brownies are still the best! These look great – thanks for sharing with Alphabakes. 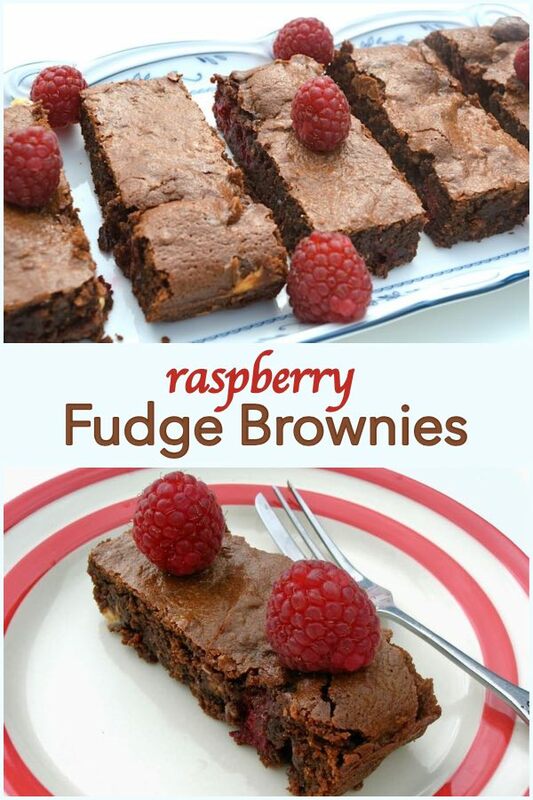 I love brownies and these look absolutely delicious especially with the raspberries. I’m sorry I didn’t get a chance to join in the USA themed WSC, so gutted! Thanks for sharing with AlphaBakes. Rasoberry brownies are a favorite of mine at a lock bakery. I’ll have to try making yours!